It takes guts to say, I am an artist. Jonathan juggles to distract her while I clip her nails. How did they get so long so fast? Her fine motor skills are developing quickly. I have the pinch marks on my throat to prove it. Then I sit in class and sip my coffee. The coffee is new. It makes me shiver with energy, at least for a while. We are reading Joyce. Easy Joyce. Dubliners . When the teacher asks if anyone has read Ulysses , no hands go up. I volunteer, "I've tried and failed to read Ulysses ," which gets a laugh and murmurs of agreement from the class. I think of Ireland. 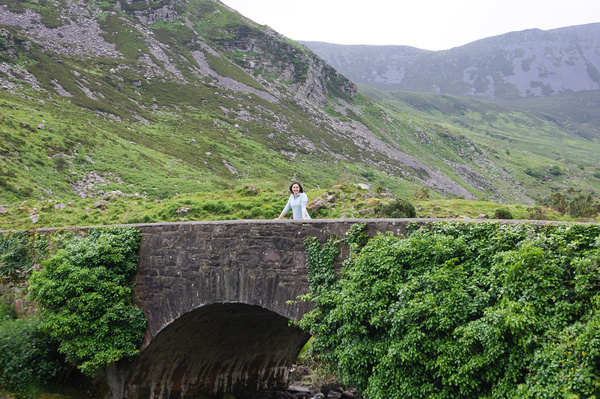 We visited two years ago and traveled from Dublin to Killarney by train. I wrote and enjoyed both the flicker of emerald fields through the windows and my own reflection in the glass. It was a simpler, vainer time. There was a stop called Mallow. I ate butterscotch ice cream. We tramped the Dunloe Gap. Back to Joyce. "Araby." I wonder what a rusted bicycle pump is doing in the Garden of Eden. There are people who are compelled to write what they see, what they know, what they think, even if it isn't popular. Even if it is ridiculed. Even if it earns no money. Glimmers are all they need. I listen to a podcast. The host says she has decided not to use the word "should" anymore. There is no need to obligate herself to the whims of life. When she does that, she saps her energy and emotional health, leaving only a depleted version of herself for her husband, daughter, friends. The people who ought to receive the best of what she can offer. Ticket controllers move through the tram car. This happens frequently now. A change since we moved to Oslo five years ago. The boy across from me shrugs and gestures to his dead iPhone. He can't pull up his ticket. He waits for the control officer to give him a receipt for his fine. Instead, the officer reaches into his pocket and presents a portable iPhone charger, a small purple cylinder, and the boy is able to show his ticket. I can feel his relief. A bitter wind fights the static electricity for control over my unwashed hair. The next bus is eight minutes away. I stomp my feet to warm them. When I'm acting in my role as mother, I am keenly aware that I'm not reading enough, that I'm falling behind on my schoolwork, that my writing life is disintegrating in my absence. When I'm acting in my role as student, I am painfully aware that I am not holding my daughter in my arms, teaching her, protecting her, enjoying her. When I'm writing, which is almost never, I know I'm neglecting my home, as well as the work I would get paid to do. I am divided against myself. I duck into Godt Brød and buy a loaf of surdeigs brød. Sourdough bread. My pronunciation is terrible. The woman behind the counter almost hands me something else. I apologize in English. She shakes her head and continues to speak to me in Norwegian, slowly and clearly. She has an eyebrow ring and a frown wrinkle between her eyes. Evidently, she bites her nails. But she is patient with me. Joyce lived in self-imposed exile almost his entire life. France, Switzerland, Italy. He had several children. My daughter's neck smells like honey and sweat. I want to sit down and write once she goes to bed, but she decides to cry at bedtime for the first time in weeks. I want to spend time in my story world. I want to believe I am still an artist. I want to paint the blue horse. I want to be willing to live in exile for my art. I want to preserve the best version of myself for the people who matter the most to me. I want to compartmentalize. I want to have a single train of thought for longer than a minute at a time. Tomorrow I'll analyze Octavia Butler's "Bloodchild" with my fellow masters' candidates in an exercise that brings us one step closer to developing our own problem statements for our own theses. I wonder what my thesis will look like when it is complete. I wonder if I have what it takes to write something new, interesting, and relevant to the conversation. I've bathed my daughter something like two hundred times in this tub. At first, she was itty and coiled up, and she lay in the little plastic swoop in the tub and stared at me. Now she pulls herself up to standing at the edge of the tub. It is the second to last bath she will have here in this flat. We move on Friday. I am so tired I can feel it in my tongue. I need to read Huckleberry Finn. I need to review Norwegian vocabulary. I need to revisit Joyce. Epiphanies are important. Revelation. Clarity. Insight. In literature, authors use character epiphanies to reveal truth to the reader. They are usually intentional, and the path to them is littered with clues. But Joyce considered epiphanies differently. For him, epiphanies in the text were errors, psychological slips. Truth seen in spite of himself, in spite of myself. I am so tired I can feel it in my knees. My house is a mess. I am so tired I can feel it in my eardrums. I have only embraced my husband once today. I am so tired I can feel it in my wrists. Applications for barnehage (preschool) are due before the end of the month. I am so tired I can feel it in my teeth. I have to stay up and use my breast pump. I am so tired I can feel it in the nape of my neck. The movers arrive tomorrow to help us finish packing. No linear thought. No logic for me today. I'm embracing the scattershot. It's the only way I can find the wherewithal to write. And when I am acting in my role as writer, I am nurturing that part of myself that makes me a better wife and mother, a better student and employee, a better daughter and sister and friend, a better human. This isn't the first time I've brushed up against this particular epiphany and I doubt it will be the last. But I won't chastise myself for that shortcoming. Life is too short for "should." I am an artist.